One storm system has already hit; closing roads, triggering mudslides, and causing power outages. Some residents are being ordered to evacuate as another system is due to hit in the next day or two. And by the end of the week, a third system is anticipated…and they’re saying that this could be the strongest of them all. At this point, there are quite a few unknowns. But if you live in the area, are you really going to wait for all the specifics to be nailed down with 100% certainty to do something? Some have already been imposed. More are in the works. Some are relatively small. Others are positively huge. Certain goods and countries are being exempted, while other goods and countries are getting a double shot. The situation could last for years, or it could all end with the stroke of a pen. On and on, there’s a lot of uncertainty and the specifics are few and far between. But as with a looming storm, you don’t have to wait for 100% clarity…because you already know everything you need to know to make a solid plan. Are you going to roll the tariffs into the prices themselves? Or are they going to be presented as a separate surcharge or line item? Should you be striving to remain whole with respect to the margin percentages or the margin dollars? Are individual account teams going to have some level of discretion in how they cover the costs? What are their options? Are you going to expect your suppliers to absorb a certain portion of the burden, while your customers absorb the rest? Are you going to take additional profit under the “cover” of tariff increases? If so, when, where, and how much will you seek? How are you going to communicate these things to customers? How will you explain the things that differ from their expectations? Are there revenue-based volume rebates or commission structures that could be artificially affected? How will you deal with them? As you can see, these are pretty significant decisions and considerations. These things can all be hammered out prior to knowing every detail of the tariff policies that are ultimately enacted. And once the specifics are known, you can just plug those details into your plan and execute. The point is that uncertainty is no excuse for Sales Ops. After all, you know the storm is coming. You may not know how big it’s going to be, or exactly what kind of havoc it’s going to cause…but you do know that it’s coming. And without knowing anything else, you can develop an effective plan for dealing with it. How do you measure a Sales Ops function? How do you calculate what you're really getting from your investments? In this on-demand webinar, learn what other Sales Ops groups are doing to measure and communicate their contributions in dollars and cents. Isn't it frustrating when sales gets the blame for poor performance when the quality of leads is the real problem. 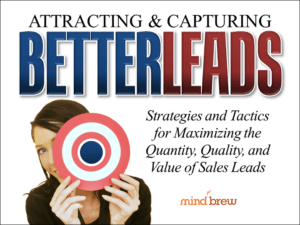 In this on-demand webinar, learn about a number of strategies and tactics for maximizing the quantity, quality, and value of your sales leads.